And there is a scene in the second half of the book where Anne and her group visit the Ipatiev house to see the location where the last Russian Tzar and his family were gunned down, so it’s a legitimate reference to my book. Since this is the last in this series of blog posts, though, it’s also a nice transition back to my regularly scheduled programming. 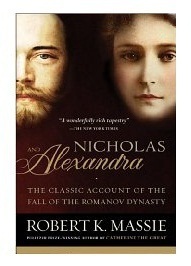 I read Nicholas and Alexandra when I was in 9th grade as part of a school assignment. While it’s billed as a non-fiction biography, though, the story read as part political and religious intrigue and part gripping horror. It made quite an impression on me, both for the fact that I had seen how the revolution and counter-revolution had played out in the Soviet Union, but also because of the terror of those final days, where you didn’t know whom to trust, and everything was so outside the experience you had been raised to expect. For anyone with an interest in Russian history, and how the Romanovs came to their bloody end, this is recognized as the standard biography to draw you into that story. It’s well-written and worth the read even if you’re more interested in the tragedy of parents trying to find a solution to heal their hemophiliac son. I got interested in this part of modern history after I read some stuff on WWI. It saddens me how the prevailing air of revolution and nationalism ended the monarchy. Nice post. Hope to read more in the future.